Contamination of a key drug used for treating high blood pressure and heart failure has caused a worldwide recall. An expert who has been sounding an alarm over the growing reliance by the United States on Chinese-made medicines said this is just another case highlighting the extensive problems of pharmaceuticals made in China. The U.S. Food and Drug Administration announced on July 13 the recall of 29 types of single and 51 types of combination valsartan medicines. The recall followed the same move by the European Medicines Agency (EMA) on July 5 when it was informed by China’s Zhejiang Huahai Pharmaceutical—a major global manufacturer of generic valsartan—that the drug had been contaminated by a substance called N-Nitrosodimethylamine (NDMA), which could cause cancer. Valsartan contamination could have started as early as 2012 according to European regulators, who speculated that it was caused by Zhejiang Huahai changing its manufacturing processes at that time. This also means that for six years, a large number of patients worldwide likely have been exposed to the cancer-causing element in their valsartan. Zhejiang Huahai Pharmaceutical did not respond to The Epoch Times’ repeated requests for comment. The company, which sold $50 million worth of valsartan in 2017 alone, acknowledged in a public statement that some of its valsartan was definitely contaminated, although it did not give out any additional details. Rosemary Gibson, a senior adviser at The Hastings Center and an author of several books on health care issues, told The Epoch Times that the case is just the latest scandal showing how defective medicines and pharmaceutical ingredients made by Chinese manufacturers are becoming a health care hazard and even a national security threat for the United States. 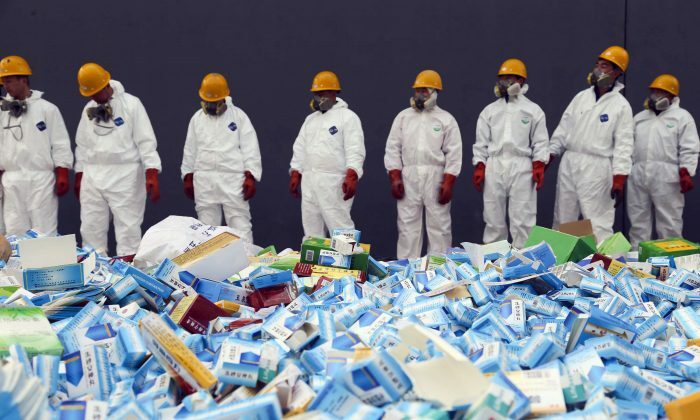 According to the annual report by U.S.–China Economic and Security Review Commission (USCC), China has been a prolific source of counterfeit and defective medicine. The Chinese regime’s regulators have proven to be incapable of cracking down on bad medicines, and many Chinese consumers prefer U.S. pharmaceutical products due to concerns over the quality of domestic ones. Zhejiang Huahai was one of the first Chinese companies to be approved to sell generic drugs in the United States, and it remains one of China’s largest exporters of pharmaceuticals to the U.S. and European markets. Gibson said the problem was not limited to Zhejiang Huahai. The valsartan contamination highlights the general issues of quality and consumer protection for Americans who rely on generic drugs manufactured by China, she said. China has been rapidly expanding its pharmaceutical manufacturing industry and is now the maker of thousands of drugs found in U.S. hospitals and pharmacies. It could soon overtake India as the dominant manufacturer of generic drugs in the United States. According to Gibson, the growing reliance on medicines made in China poses a national security hazard for America. The United States has locked into a strategic competition with the Chinese regime, which is adopting increasingly aggressive foreign policies and military expansions. In an exclusive interview with The Epoch Times in May, Rosemary Gibson discussed her new book “China RX: Exposing the Risks of America’s Dependence on China for Medicine,” co-authored with Janardan Prasad Singh, which documented what has led to China’s increasing dominance in the manufacturing of medicine and the consequences for the United States and the world. Gibson and Singh detail how the Chinese regime has overtaken—and in some cases, put out of business—many key U.S. and global drug companies by undercutting and stealing from competitors, and cutting corners. Medicine is listed among the top 10 items in the “Made in China 2025” plan, an aggressive industrial strategy the Chinese regime rolled out in 2015 that outlined China’s industrial policy for catching up and surpassing rivals like the United States, Japan, and Germany across a wide array of technological competitions. The strategy explicitly laid out Beijing’s playbook is to provide massive state subsidies and support to Chinese manufacturers to help them capture the global market, while using protectionist policies at home to exclude foreign competitors from importing products.